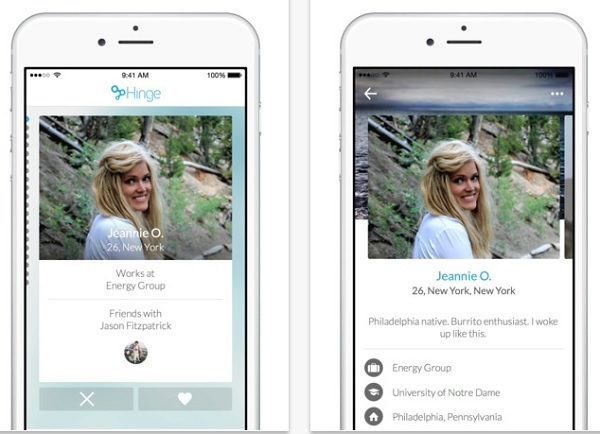 If you haven't heard of Hinge then basically it's another free to use dating app but what makes it stand out is that it's supposed to only show you friends of friends. Though it may also show you friends of your friend’s friends... I feel like I may have overused that word now. In general Hinge is sort of a good idea but only if you don't have a lot of friends in different countries. To find your friends then you need to connect your Facebook account to the app and it pulls through the information of your friends list as well as your profile info. Your profile will have your name, where you live, your last school, work etc. It also allows you to describe yourself with a few tags so people know who you are and what you like. If the tags aren't enough then you can write an about me too. The app sort of works like Tinder in that you can swipe through matches but there are limited matches and after two weeks the ones you had will disappear, whether you had a conversation or not. Users you said no to before can pop up again in your matches because I guess they think you might give them a second chance and find true love. However Hinge seems to think that the Tinder like way of swiping through users encourages hook ups rather than relationships which is what they aim to create. Swiping too often can mean that you run out of users to look at for a bit which will only cause people to stop using the app. Hinge feel they need to do something so people stop and actually think before they match with someone. And they feel that if they get rid of the swiping and make people pay, they'll only be left with users who are serious about dating. Back in 2014 Hinge did say that they planned to start charging people in 2016 so this possibility isn't all that new. What is strange is that they have said they're still thinking their possible options over. So what's changed their mind? Fact is Hinge has both a low rating in the Google Play and iTunes stores, in the Play store its average rating is 2.5 but it has over 1000 reviews rating it only 1 star which is almost double the second and third highest ratings. Hinge is a good idea but the app is known to be buggy and it isn't available everywhere. It might be available widely across America but other countries only have one city where you can really use it. Not to mention they have this most eligible section on their website which lists the most eligible users in different cities and work sectors, plus a joking 12 Donald's who are better than Donald Trump. It sounds somewhat amusing but how much more awkward is it going to be if you run into someone considered so eligible on the app? I wouldn't know whether to poke fun at them or feel tongue tied that someone so worthy wanted to match with me. Apparently this app is fairly popular and the staff does want to keep those users coming with more meaningful ways to find relationships using their apps. I'm personally not sure that making users pay for it will do that. Instead it might be an idea to roll the app out everywhere, make what you have to do on there a little clearer or put some more information on their actual website. Seeing as they're still deciding what to do, it is possible they could come up with a new feature that's worth paying for.